Well, we have officially lived in our new little town of Beaufort NC for almost three months. We are loving it more and more every day and are even starting to feel settled. Its crazy and quirky and electic. Its inspring! So, what does that mean? The hunt for a property for the new pottery has begun! I am spending a lot of time looking and researching. I feel in my heart that things will soon start to happen. The sense of community here is huge and I have a lot of people looking for properties for me. It is amazing to feel so embraced and this community is exactly what was missing in our lives before. So stay with me beacuse the race is on and we will be back in business in no time! this latest blog entry is to make an official announcement. my husband and i have made the decision to leave western north carolina and move to beaufort nc. he was given an offer too good to pass up. no worries! the pottery will stay in business, as soon as i find a studio. so keep me us in your thoughts in this crazy time of change and check back with me while the hunt for a new studio space is on. thanks y'all! more "expirements" from the electric kiln! the idea is to stay within the realm of what i have been working towards, while not fighting the inherent qualities of firing in an electric kiln. i am using a white midrange stoneware clay. i have been testing celedons and ash glazes with some pretty good results. i am also striving for a nice matte glaze, which is hard to acheive in an electric kiln. ugh. still shiny! even with the slow cool. anyway, i guess i'll have to keep you posted on that one. 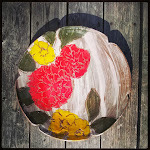 i have always been interested in carving flowers into my pots. something i really appreciated about the salt kiln was the way the carvings came out in the fire. when i was switching gears to electric firing i was driving myself crazy trying to figure out a way to translate what i was working towards in the salt kiln to something i could love in the electric kiln. then one day.... i found it! mishima! the answer to all my problems! mishima, in its most simple definition is inlaid clay. 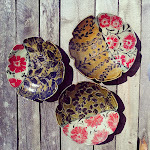 the process is still that of carving the flowers into the surface of the pot in the same manner in which i always have. but now i inlay the lines with slip. this creates the fine lines and hard edges that i love. and the best part is.... no rough surfaces. just a few flowers as a border on a pot might be enough for some potters, but no-no, not this one! more flowers please! this approach is great! now i can run my fork across my plate. and i can cover the pot in ash glazes and the images stay crisp! something, i couldnt achieve witha brush, lord knows i've tried. so i threw together this little pot trying to work out the skills i need to make these things look good. this new quest is not without challenges. 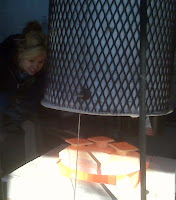 but i am excited and motivated and refreshed by my happenings in this little electric kiln. take this little pot as a "sketch" if you will, and stay tuned for what is to come. yay! One of my favorite parts of being a potter is being able to share my skills and my love for clay with others. A few times a year I work with the 4-H ers here in Haywood County making pottery for a day. This year we made sculptures of fish and sculptures of birds in a nest. Usually we start with an assignment and before long the kids are over flowing with ideas of what to make next. I love giving them their initial "assignment" and watching how kids let their creativity go crazy. They don't hold anything back. Its amazing! And not to mention inspirational! my first "decent" glaze results in the electric kiln. celedon and basic white glaze with wax resist. sorry for my delayed posts. with summer in full swing, teaching a little pottery here and there, and the farm keeping me at 120%....oh yeah... and the pottery too! no wonder blogging has escaped me! to catch you up, i am currently deep into the exploration of cone 6 oxidation glazes. i have had mixed results and will continue to expiriment. pictures will be posted soon! thanks for checkin in with me! Please read and pass along. Thanks! more of the slip investigation. again, all of these pots are greenware. they have not been bisque fired or glaze fired. once they are finished...my goal is for the slip to be much lighter than the claybody, once the pot has been fired. New photos are up! I have added a slide show to the blog. 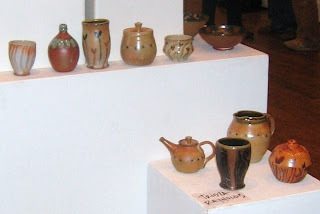 These featured pots were all made within the last three years. They are fired to approximately cone 10 in a gas kiln with a fairly light reduction atmosphere. They are glazed with layers of ash glazes and other glazes to create this fluid characteristic that I have been interested in. 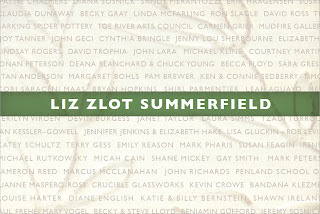 I am inspired by the suggestion of nature created by the combinations and textures of the glazes. This is my jumping off point to my current exploration into salt and soda firing. 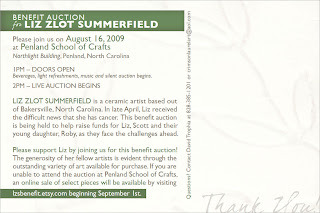 As a lifelong resident of North Carolina, I am intrigued by NC's heritage in pottery. These traditional potters often used salt in their kilns combined with alkaline glazes (ash glazes). I feel it is important to preserve this tradition, while I also intend to combine this style with my own, slightly more modern approach. 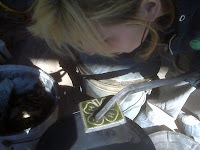 When the kiln is complete I will post pictures with the results as we fire it! I finally got some more recent shots of reduction fired-ash glaze pots from previous years. I am currently editing them, but should have them up by the first of the week! Happy Valentines Day! Sorry folks! I have not been to the blog spot in awhile! I still have not finished the salt kiln, but instead, I have been working on a very important project. I have photo documented a day in the process of this project. 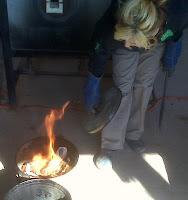 The pictures below are pictures of me raku firing, a fascinating approach to firing pottery. Keep reading! To begin, the pots, or in this case, the tiles, are made, allowed to dry, and bisque fired in an electric kiln to about 1650F degrees. The clay is now hard enough to handle, but still porous. I am ready to apply the glaze. Each piece is hand decorated. My approach to decoration is to mask off the design. I use pinstriping tape (for automobiles!). I brush the glaze over top of the design and anywhere I want the glaze to appear. 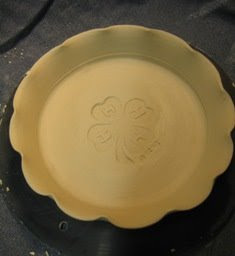 Once the glaze dries, I remove the tape from the pot and the negative shapes create a pattern; in this case, the clover, the symbol of 4-H worldwide. Now I am ready to fire. 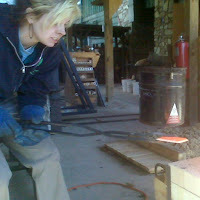 Each piece is fired individually in a small kiln called a raku kiln. 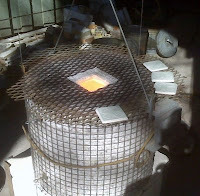 The first picture is of the raku kiln with the coasters on top waiting to be fired. Notice the orange glow of the atmosphere inside. There are three to five coasters firing at once. It takes about 45 minutes for the the kiln to reach a temperature. The kiln is rigged on a pulley system to make it easier to raise the basket and retrieve the coasters from inside. Once the kiln reaches 1850F and while the coaster is still red hot, I pull them, one at a time, from the kiln using long tongs and fireproof gloves. The coaster is then transferred to a metal trashcan. The trashcan is packed with newspaper, a combustible material. Once the coaster is placed in the trashcan, the newspapers instantly burst into flames. I place more newspapers on top of the coaster and replace the lid. This process creates heavy smoke and an atmosphere void of oxygen. This atmosphere, called "reduction", creates the natural black color of the claybody. 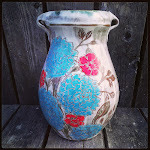 The glazes I use are called crackle glazes. After a few moments, I use the tongs to pull the coaster back out of the trashcan. I bring the coaster close to my face and blow on it and I can hear the crackling and pinging of the glaze while the crackle effect is being achieved. I place the coaster back in the trashcan, again loaded with newspaper and wait for the paper to ignite. I replace the lid. Sometimes I repeat this process up to three times depending on how much crackling I would like to have on a certain piece. Meanwhile I have more coasters in the kiln slowly warming in the kiln, waiting for their turn. Then the process starts again! Thanks for reading. Come back and visit soon! I hope to have the salt/soda kiln finished before Spring. In addition to my personal line of pottery, I have been commissioned to develop a line of pottery for 4H. I am very excited in pursuing this line. These pots are "greenware" and have not yet been glazed. I have included pictures of a mug, a casserole dish and a pie plate. These are just a few examples of what I have been working on. The line will feature many pieces great for gift giving, awards and serving dishes perfect for those wonderful 4H potluck suppers!